In our Picks to Click, we feature eight players or units from across the state that we feel will have breakout performances on Friday night. This season, we’ve assembled a team of eight media members across the state to each select one player (or unit) each week. We will track the cumulative statistics of our selections throughout the season similar to fantasy scoring. Picks to Click contributors for the 2017 season include: John Baetz (Kansas Pregame Magazine); Dion Clisso (PrepsKC.com); Taylor Eldridge (Wichita Eagle); Matt Gilmore (Kpreps.com); Chet Kuplen (Kansas-Sports.com & @sportsinkansas); Brent Maycock (Topeka Capital Journal); Conor Nicholl (Kpreps.com); and Mark Schremmer (Kpreps.com). Check back next Thursday to see our picks for Week 6, and how the players performed that we picked the week prior. See the bottom of this article for details. Allen has rushed for 754 yards in the first four weeks which is very impressive, but it's his touchdown numbers that are the most impressive. The senior has 17 rushing touchdowns and a punt return for touchdown to give him 18 total touchdowns in 2017. Allen won't be the biggest guy on the field at 5-foot-9 and 174-pounds, but he may be the most athletic. He features nice speed and has a ridiculous vertical jump of 41 inches. He also has Bennington to a 4-0 start this season as they will be at home this week against Lincoln. Allen is turning himself into one of the top 8-man players in the state so far this season. Clark (5-8, 165) is part of a talented group of back in the Miege offense. The senior has carried 35 times for 331 yards and three touchdowns. Clark is averaging 9.5 yards per carry, second behind sophomore Brison Cobbins who is averaging 9.7 yards per carry. Cobbins leads the Stags with 380 yards and four scores. Miege has been more reliant on the ground this season having averaged 242 yards rushing per game compared to 160 yards per game a season ago. Last season, Clark was second on the team with 344 yards and five touchdowns behind Cobbins’ outstanding freshman season in which he rushed for 841 yards and 11 scores. Miege has a road test on Thursday against winless Blue Valley West. The Jaguars are giving up nearly 52 points per game. Through four games the Mustangs have rolled up 1,639 yards rushing with 27 scores on the ground, totaling at least 46 points in each of their four wins. Freshman quarterback Cameron Beardsley has completed 7 of the just 13 passes he's thrown on the season for 152 yards and 2 TDs, and senior Jordan Yungeberg has 505 yards rushing and 9 touchdowns on just 70 carries, an impressive 7.21 yards per carry average. But the catalyst for this offense is sophomore running back Cole Coggins who already has 735 yards and 11 scores on just 68 carries this season, good for an average of 10.81 yards per carry. Coggins tallied 238 yards rushing and four scores on 20 carries in the Mustangs 56-20 win over Ellis Friday night. Dooley (6-2, 190) is a rangy linebacker with an instinct for finding the football. The Olathe North senior is among the state’s leaders in tackles after four games with 79 stops. Dooley posted 28 stops in the Eagles’ 39-25 win over Wichita Heights to open the season, and added 22 more tackles and a sack in last week’s loss to Shawnee Mission East. Dooley and the Eagles have lost three straight contests, and have a big challenge this week in slowing down Lawrence. The Chesty Lions are entering Friday’s game averaging 45 points per game, but struggled in a 35-28 win over winless Shawnee Mission West last week. Still, Dooley figures to have plenty of opportunities to rack up tackles against a Lawrence offense that averages 52 rush attempts for 326 yards per game. The junior has been one of the most productive quarterbacks in the state, passing for more 300 yards per game. In all, Eldridge has completed 110 of 164 passes for 1,266 yards with 11 touchdowns and five interceptions. He's also rushed for 176 yards and two touchdowns. His best game came in Week 1 when he passed for 512 yards and five touchdowns during a 70-49 win over Blue Valley West. The Timberwolves play Blue Valley Northwest at home this week. Led by returning All-Class 3A selection Austin Youngers, Garden Plain’s offense has been its typical productive self, cranking out at least 390 total yards and 28 points in every game this year. 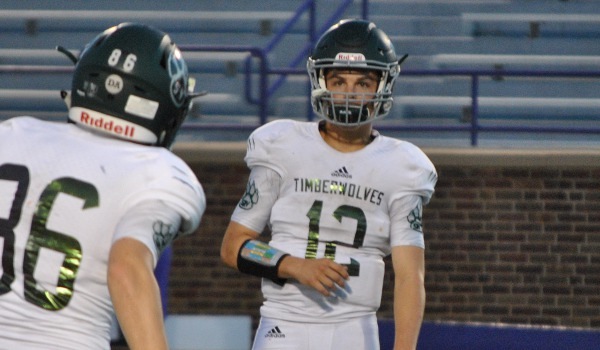 Last week, the Owls plowed their way to 642 yards of total offense including 557 on the ground behind Youngers, Alex Cordova, Brady Klein, Hayden Horacek, Jonny Becker and Conner Eastburn in a 55-14 win over Wichita Independent. Matching or surpassing that total could happen again this week against a Belle Plaine team which might be coming off a 68-0 win over Northeast-Arma, but gave up 98, 74 and 70 points in its first three games against Central Plains League foes Conway Springs, Cheney and Chaparral. Shawnee Mission Northwest is just 1-3 on the season, but has gone up against three tough defenses in Lawrence, Shawnee Mission East, and Lawrence Free State. That hasn't stopped Stewart and the Cougars' offense from airing it out this season, as the junior has already thrown for 1,110 yards. This Friday Stewart will get a crack at winless Shawnee Mission West, which has allowed an average of 37.3 points per game this season. This should be a big game for Stewart, as SM Northwest will look to register its first Sunflower League victory of the season. Wiltse, the Cougars’ 6-foot-4 junior wide receiver/end has delivered a nice fall after a breakout season in basketball. He has five catches for 167 yards and four touchdowns and helped junior Anton Foust in his first year under center. Foust has completed 12 of 19 passes for 284 yards with five scores against no interceptions. Last week, Wiltse had a 49-yard catch for a touchdown in a huge 22-20 victory against Victoria. As a sophomore, Wiltse recorded nine catches for 233 yards and four scores. In 2016, he tallied two catches for 53 yards and a touchdown in a 28-20 road loss to Sharon Springs-Wallace County to open Eight-Man, Division II, District 6 play. This year, Otis-Bison (3-1) gets the Wildcats (1-3) at home in a critical contest. The Foust-Wiltse connection is likely going to be key if Otis-Bison wants to return to the playoffs after narrowly missing last season. - The objective will be to have the most cumulative points over the course of the season. - Participants may select a quarterback, running back, WR/TE, offensive line or a defensive player each week. - Everyone must pick a WR/TE, offensive line and defensive player at least once. - Points will be rewarded only for the player's offensive or defensive stats, depending on how you designate the player that week. For instance, if you pick a running back then you will not receive any of his points for defense.